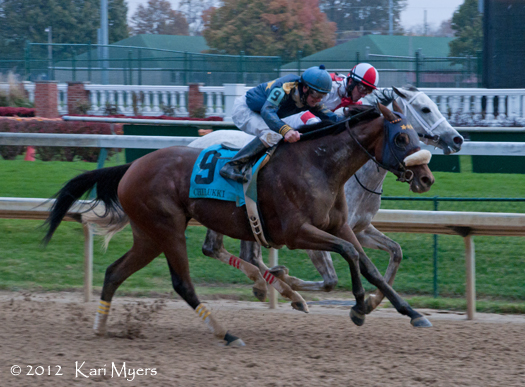 November 3, 2012: Brushed by a Star (#9) edges out Joyful Victory for a win in the Grade 2 Chilukki Stakes at Churchill Downs. I try to go to the Breeders’ Cup each year, but I wasn’t able to get out to California to attend the 2012 edition at Santa Anita. Instead, I drove to Kentucky at the beginning of November with some friends and spent the week at Churchill Downs, area farms, and the Fasig-Tipton and Keeneland sales. I believe I have succeeded in fully converting my friend Amy into a genuine racing fan! The Grade 2 Chilukki Stakes was run while we were at the track on Breeders’ Cup Saturday, and it was quite a good field of fillies and mares. The day was a bit overcast, but the rain held off until just after the race started. 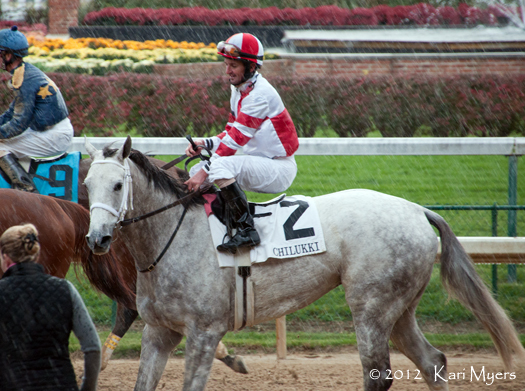 It was pouring at the very end, but no one really seemed to notice–especially the winning connections. Brushed by a Star beat Joyful Victory by a head, with Salty Strike back in third. Another one of my favorites, Dancinginherdreams, was a well-beaten 9th out of 10. Her trainer, Bill Mott, saddled Royal Delta to win the Breeders’ Cup Ladies Classic the night before, so he didn’t really have much to complain about. 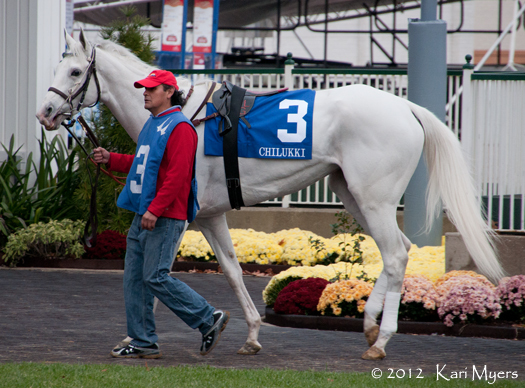 November 3, 2012: Dancinginherdreams in the paddock before the Grade 2 Chilukki. Isn’t she lovely? She certainly stands out in a crowd! 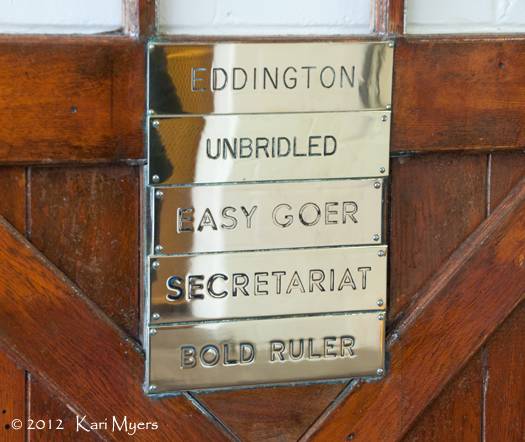 One of the more historic stalls at Claiborne Farm. 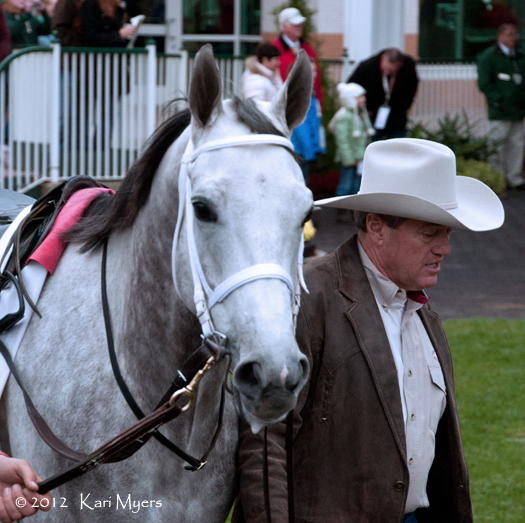 November 3, 2012: Larry Jones walks Joyful Victory around the Churchill Downs paddock. This isn’t something you often see trainers do, but Mr. Jones seems to be very hands-on with his horses and can frequently be seen walking them along with the grooms. He also rides many of them in the morning during their gallops. He’s truly one of my favorite trainers. November 3, 2012: Joyful Victory, ridden by Robby Albarado, returns to be unsaddled after the Chilukki Stakes as the rain starts to come down. 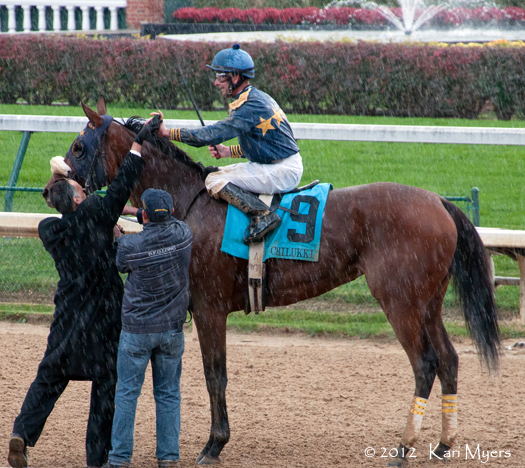 November 3, 2012: Brushed by a Star, ridden by Corey Lanerie, gets some happy hugs and pats in the pouring rain after her victory in the Chilukki Stakes. 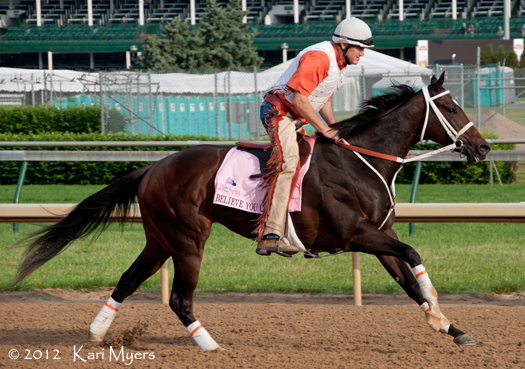 May 3, 2012: Trainer Larry Jones gallops Believe You Can at Churchill Downs the day before her win in the Kentucky Oaks. The beautiful Believe You Can (Proud Citizen – El Fasto) won the Grade 1 Kentucky Oaks in May and came in 3rd in the Grade 1 Mother Goose in her next start. Her connections felt she needed some time off, so she had several months rest before resuming training with Larry Jones. She is back on the work tab as of the beginning of December, so it will be fun to see if she returns to form in 2013. Believe You Can was ridden by Rosie Napravnik, who became the first female jockey to win the Kentucky Oaks in its 138th running.